People outside of Texas have long suspected that Texans were crazy. Well, we have come out and given everyone proof today that we have lost our minds. The front page of the paper today showed that we are paying high school football coaches twice as much as we are paying our teachers. 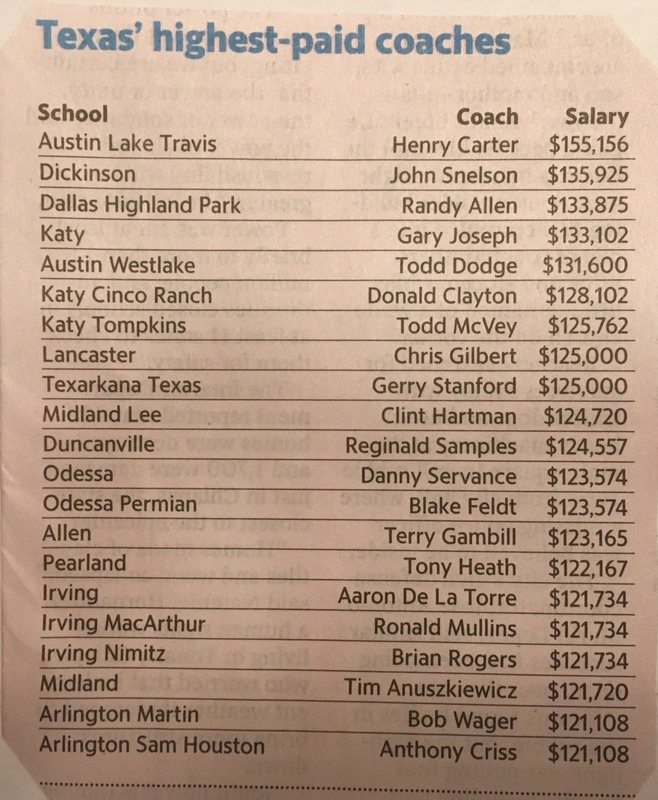 One affluent district around Austin is paying their head coach $155,156. That is $30,000 more than the Principal makes, and three times more than what the teachers make. Wow. Just wow. We have lost our minds, apparently. Don’t get me wrong. I love football, but I also love teaching and have a great respect for what teachers do to prepare kids for life. Should we really be paying a coach two to three times more than the teacher that is teaching your kid English, Math, Science, or History, Music, Art, etc.? Really, is football THAT important to us as a state? I don’t fault coaches for making six figures. I fault tax payers for letting this happen and not giving equal pay to the thousands of other teachers who are educating their kids. Oh, I get it. We can’t “afford” to give everyone a raise to six figures. Um hum; right. I think we find a way to justify whatever we want to do as a society. I am just shaking my head at the absurdity of the situation and wondering how this happened in the first place. How did anyone in authority have the audacity to think this up? Football has always been a religion here in Texas. Sadly, it distorts for our youth what matters in life. Anyone who has been an athlete realizes that there is life after football, and you had better be prepared for that. It sure helps if you can read, speak, write, comprehend math, and know your science and history. To all my coaching friends, this is not an indictment against you or anything you have done. I love you guys and I love the sport of football. I just think we need to put it in perspective with the rest of education. Who knows, maybe I am the crazy one. Crazy by Dag Skognes is licensed under a Creative Commons Uznanie autorstwa-Na tych samych warunkach 4.0 Międzynarodowe License.